We know so many parents, community members, and especially students, past and present, who are big fans of Berkeley’s public school Garden & Cooking Program. We are too, because the program provides invaluable health, nutrition, and food literacy lessons to a broad swath of Berkeley’s kids. We’ve been concerned by the repeated cuts to the program over the past few years, but we’ve mobilized and won victories, like the soda tax, that could soon shore up funding. Right now, the program still faces a funding gap, and we’re asking supporters to speak up. Tomorrow night, the School Board will make decisions about funding the program for the 2015-2016 school year. There is currently no funding in the BUSD 2015-2016 budget for school garden programs. Because the program is highly valued, and since the recent passage of Measure D (soda tax) should eventually provide funding for the program, there is some expectation that the City and the School District will fund the program and restore it to its prior robust state. However, at this time there is no guarantee that will happen. Concerned citizens have the opportunity right now to express their support for the program, and for its maintenance and expansion, because funding decisions are about to be made. On April 22, 2015, Jezra Thompson, Program Supervisor for the Gardening and Cooking Program, will present the School Board with a funding proposal for 2015-2016. As currently written, the proposal continues the “subsistence” funding model that has been in place this year. We are requesting your help, not only to support the existing funding proposal, but also to advocate for increased funding to restore our gardening program to its prior staffing level, and support any additional funding after that for bringing cooking back into our instruction beyond the garden. Attending the School Board meeting on April 22, 2015 and signing up for public comment. (http://www.berkeleyschools.net/school-board/board-meeting-information/). Attending the Second Annual Gala Fundraiser for the BUSD Gardening and Cooking Program on May 1, 2015 at the International House. Details on the event are here and tickets can be purchased here. (F) How the City and the District must come together to provide this funding, so that Measure D funds do not simply replace District funding, but supplement and expand the funding level so that more robust instruction focused on integration with Common Core and closing of achievement gaps can be accomplished. 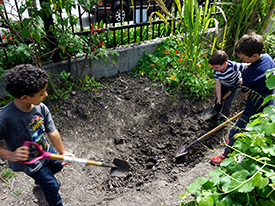 This entry was posted in Blog and tagged BUSD, Garden and Cooking Program, Measure D, school garden, soda tax, take action by Ecology Center. Bookmark the permalink.